I'm officially on spring break (even though it's not technically spring yet)! No more school work until March 14th. I'm very excited. My best friend is coming to visit next weekend, and I haven't seen her 4 years. I know that is insane. We've been best friends since we were 2. I don't know what else I'll be doing spring break, but I'm sure there will be some polish shopping involved! Today, I have a great Zoya for you. Audrina is a bright purple-pink creme. Spring...summer...are you here yet? This is a perfect color for the warmer months. I love bright cremes. I like this shade too, it's a nice variation from your typical pinks,corals, and oranges you may see in nail polish colors for this season. Great color, I definitely recommend it. I don't think Zoya really does anything wrong. I love their cremes, shimmers, glitters, duchromes, and sheers! I love this colour, and it actually reminds me of Audrina, I feel like she wore a dress or bathing suit or something in this colour once on the Hills...am I weird to think this? That is so pretty. I agree, Zoya does polish right. this polish is very pretty.. makes me want more zoyas! 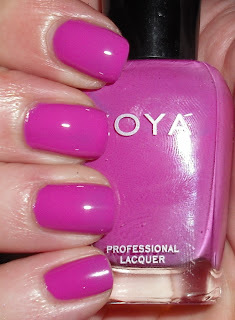 This is one of my all time favorite Zoya polishes!! It looks amazing on you! Such a pretty color. Beautiful colour! Unfortunately my spring break isn't until after next week. Super pretty. Why don't I own this color? I feel like I've considered buying it a hundred times. I think this summer is definitely the time for it.